After one quarter of play Monday night, St. Paul girls basketball led league rival Perrydale 10-0. The first frame was as good a defensive quarter as the Bucks have had all season – a testament to their ability to lock teams up and never give an inch. The game finished 40-15 in favor of St. Paul, but it wasn't a smooth road to a comfortable victory despite the defensive dominance. The Bucks (17-0, 9-0 Casco League) scored a meager two points in the second quarter, leading to a slim 12-6 advantage at the break. Perrydale flexed its muscle on defense as well. The Pirates (14-4, 9-2) have only given up 40 points twice this season – both times against St. Paul. In every other game, they've held teams to totals as low as 12 and usually hovering in the high teens or low 20s. 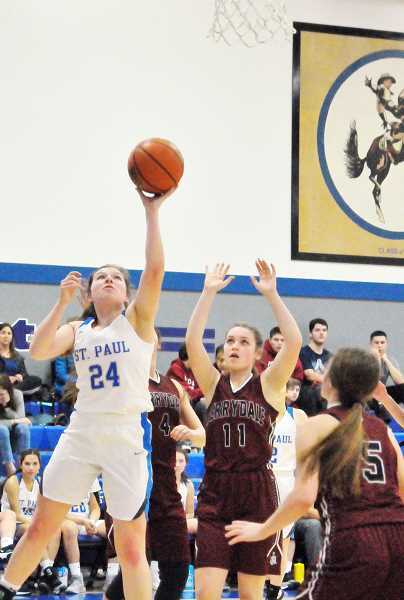 Where St. Paul struggled on offense was counteracting Perrydale's rapidly shifting double teams, which brought constant pressure on the ball handler and made post entry passes difficult for much of the contest. It was only after St. Paul's defense started to wear Perrydale down on the other end that the Pirates' defense began to show cracks in the armor. "The only other time we battled this year like that was against Joseph," Bucks coach Dave Matlock said. "Their pressure was phenomenal and you can see why they are holding teams to such low totals. It looked like there were seven of them out there." Matlock said his team displayed uncharacteristic lack of poise in the second quarter, which led to the unusual 6-2 score line in favor of Perrydale. The team appeared rattled by the full- and half-court pressure – unable to score with rapid pace the way it had in nearly every game prior. "We became somebody else in the second quarter," Matlock said. "The girls I saw in the second half were our girls. We started to make the extra pass, our spacing was better, we were kicking the ball to the weak side and we finished better. At halftime, I told them we have to be in control of the emotion of the game, not at the mercy of it." St. Paul came out in the third quarter and engulfed Perrydale on defense. The Bucks allowed just one point and doubled their own total to take a 24-7 lead into the final quarter of play. After that, they blew the doors off. Junior Isabelle Wyss – who led the Bucks with 19 points – turned defense into offense and scored myriad buckets in transition. She used her strength to bully opposing players to the bucket and finished with patience. Led by Wyss, St. Paul outscored Perrydale 16-8 in the fourth quarter. Much of the Pirates' scoring came with St. Paul's substitutes in the game, too. In a battle of two top teams in the Casco League, St. Paul proved why it sits atop the standings and showed why it is the No. 1 team in the OSAA class 1A rankings. "It's good to get through adversity like that and come out on the other side," Matlock said. "It means nothing to beat up on teams that aren't as good as you. But when you shut down a team that is as good as you – that is a great building block for postseason play." The Bucks now hold wins over No. 3 Joseph and No. 12 Perrydale – cementing a résumé that should set them up nicely for the postseason. Watching this team play defense, it's easy to see why nobody has been able to crack the code against this group so far. 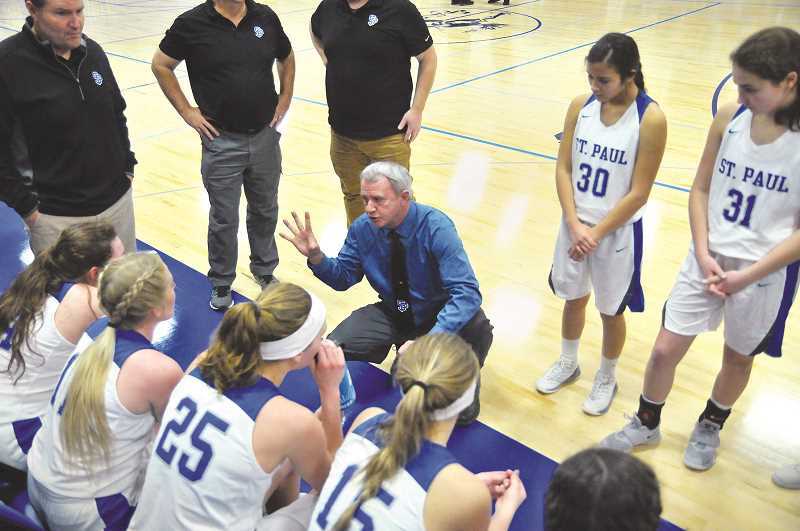 St. Paul plays with purpose, constantly locked in on the defensive end and making adjustments like it's second nature. On offense, when they're rolling, the Bucks move the ball with pace and almost instinctually know where their teammates are going to be. "They have played together long enough and run a lot of shell defense," Matlock said. "If you throw them out there, it's amazing how they can read each other's mind and angles. It's not even communicated a lot of times, but they know where they're supposed to be." The Bucks are smart off the floor, too, boasting a team grade-point average of 3.88. Matlock said this team prides itself in being as strong in the classroom as it is between the lines. Next up on St. Paul's schedule is a trip to Jewell on Friday. After that, only seven games remain before the Bucks' state title run begins in earnest. If they keep playing like this, it's hard to imagine anyone putting a blemish on their record or stopping them from hoisting the championship trophy. "No matter how hard they're pushed, they seem to find a way to get through it and thrive from it," Matlock said. "That's the mark of a very good team."